To mark the recent announcement of three additional A350 non-stop flights between Vancouver and Hong Kong, increasing the frequency from 14 to 17 flights per week, Cathay Pacific Airways celebrates with special airfares from Canada to over 40 destinations in Asia. For a limited period, Cathay Pacific is offering savings up to 20% off select round round-trip Economy Class airfares and up to 27% off select round-trip Premium Economy Class airfares. These airfares are on sale from now until 14 September 14, 2016 and available for departures between 28 March 2017 to 31 May 2017, inclusive. Departures from other Canadian cities are available for an additional fee. Above pricing is for Mondaythrough Thursday departures (weekend fares available) and include taxes and fees, exact amount will be quoted once flights and dates are selected. Seats are limited and other rules and restrictions apply. For fare details and bookings, visit www.cathaypacific.com/ca. In 1983, Cathay Pacific became the first airline to operate direct flights between Vancouver and Hong Kong. 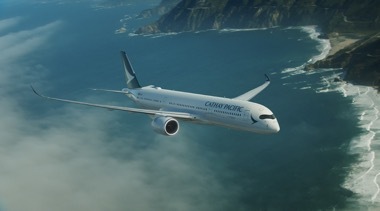 Backed by more than three decades of quality service, passengers on Cathay Pacific’s three-weekly morning flights can look forward to experiencing our newest and most environmentally friendly aircraft – the Airbus A350-900, which features state-of-the-art cabin products, an enhanced inflight entertainment system and WIFI connectivity in all classes.